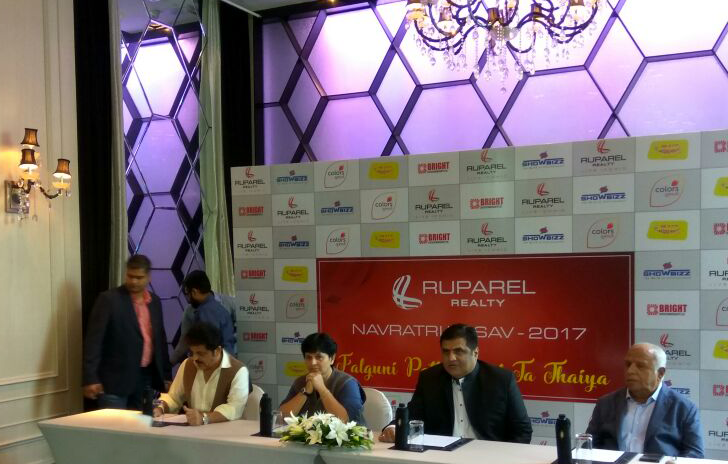 August 22, 2017: Ruparel Realty today, announced their association with Falguni Pathak who will captivate the predominantly Gujarati suburb of Borivali this Navratri – 2017. Falguni Pathak will be performing live for 9 consecutive days at Late Shri Pramod Mahajan sports complex of Borivali enthralling the audience in the festive essence of Navratri. The event is being organized by Showbizz and Widespan Entertainment and is anticipated to be the grandest Navratri event in Mumbai. With Ruparel Realty as the title sponsor, Falguni Pathak, the „Queen of Dandiya‟ as prevalently known by her fans will perform live amongst 20,000 to 25,000 audience each day in the festival that will run from September 21 to September 29, 2017. Mr Amit Ruparel, Managing Director, Ruparel Realty said "Today's organizations are progressively recognizing festivals to promote a sense of bonding and to show their respect to local culture. Ruparel being a secular company believes in celebrating all festivals with fervor and enthusiasm. We have a lot of customers who are zealous about Navratri as a festival. Dandiya is an occasion to celebrate with families; it gives us immense happiness to see families bond over dandiya". “I am delighted to be associated with Ruparel Realty and perform at Late Shri Pramod Mahajan sports complex. This is the most awaited time of the year for me as I look forward to soak in the spirit and festivities of Navratri. We are preparing the best of songs that offer great beats for Dandiya and Garba enthusiasts. Specially for this season i have recreated an old Gujarati song “jode rejo raaj” and the video is out on my youtube channel. I just focus on the fact that the audience should have a great time." Added Dandiya Queen, Falguni Pathak Navratri being a festival of color and joy attracts a huge number of young crowds from the suburbs. This year the nine day festival is going to be grander with Falguni returning to Borivali again.